Numerous genera of tree-like corals, often found in deeper waters, are referred to as Black Corals. The common name is at first confusing because these corals are generally white or pale orange in life. There are about 230 species found all around the world even if the are most common in tropical and subtropical seas. . 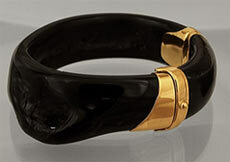 The name Black Coral refers to the distinctive black or dark brown color of its skeleton which is often polished to used for jewellery. Their polyps are short and cylindrical, each with six tentacles that are covered with stinger cells. 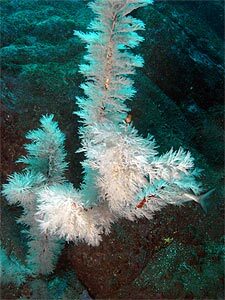 Black coral polyps are not able to retract their tentacles. 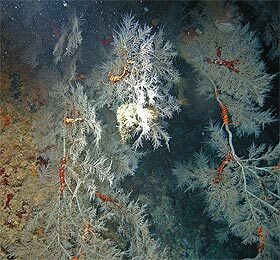 They lack the symbiotic algae that many other corals live with in their tissues, this allows them to live in deeper darker waters than most corals. Depending on water temperature, black corals can be very slow growing and can live for several hundred thousands of years.